Toddler,Preschool, Kindergarten and Elementary students enjoy a daily special class in art, music, gardening,yoga, gym or Spanish. Weather permitting, all classes take advantage of outdoor recreation on our beautiful playground. Students are provided a snack daily and Kindergarten, Full day Preschool and lower elementary students eat lunch in school as well. Field trips are regularly offered to local farms, museums and theaters. Most of the class time is spent in individual and small-group work. This uninterrupted period allows the individual and the class to develop a work cycle. Children work independently and purposely. They are free to move where their interests and abilities take them, thus developing their own sense of pace and rhythm. Teachers offer guidance and support while initiating activities and responding to the children’s individual abilities and interests. The daily schedule may also include collecting gatherings for discussions, music, stories, games, celebrations, group lessons and guest visits. 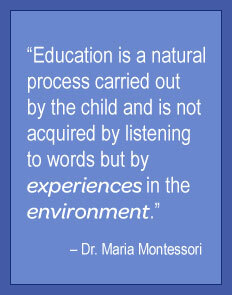 The Kindergarten program brings students into the abstract level of learning. Class time offers opportunity for more special projects, field trips, community service and daily literature and writing-based lessons in preparation for first grade. Kindergarten students enjoy the unique experience of being leaders in their 3-6 classroom.